I'm trying to submit a new application to the App Store but now Apple requires screenshots for iPhones of 4.7 inch and 5.5 inch. Anyone has these screenshot specifications (size)? I also tried to use iPad's size screenshots, but that didn't work either. I didn't receive any advice or email from Apple with this information and I don't see any help in iTunes Connect. Hope this helps. Even Apple's Documentation on the matter is incomplete. Update: Apple has introduced a new Media Manager which requires only that you create artwork for the largest iPhone and/or iPad devices. The smaller images will be created for you. Note that if you hadn't been creating iPad Pro images before, you have to now (if you support iPad). Update: Screenshots and app previews for new devices now supported. This answer is updated for Xcode 10. This is 1242 x 2688 pixels. You can create this size image using the iPhone XS Max simulator. This is 1242 x 2208 pixels. You can create this size image using the iPhone 8 Plus simulator. That is 2048 x 2732 pixels. You can create this size image using the iPad Pro (12.9-inch) (3rd generation) simulator. That is 2048 x 2732 pixels. You can create this size image using the iPad Pro (12.9-inch) (2nd generation) simulator. However, this is the exact same size as the iPad Pro (3rd generation), so most people can use the same screenshots here. But see this. The pixel dimensions above are the full screen portrait orientation sizes. You shouldn't include the status bar, so you can either paste background color over the status bar text and icons or crop them out and scale the image back up. 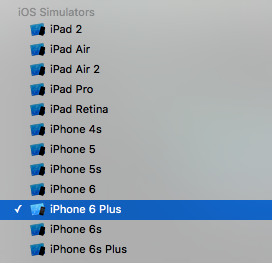 To get screenshots of the proper size without having to create them manually -- run your app in the latest version of Xcode and choose the iPhone you need screenshots for, then hit cmd-s while viewing the simulator. This will save a screenshot to your desktop in the full resolution that you need for submission. As noted below by @HoffZ, be sure that the scale is set to 100%. In Xcode 9, in addition to setting the Window Scale to 100% (⌘1) it is now necessary to also uncheck Optimize Rendering for Window Scale in the debug menu in order to get a screenshot of the proper resolution. Good reference guide here: http://www.paintcodeapp.com/news/iphone-6-screens-demystified (talks about resolutions and downsampling of the iPhone 6+). Now Apple Inc. added a new device screen shots also over iTunesconnect that is iPad Pro. Here are all sizes of screen shots which iTunesconnects requires. Also - please note that you may have transparency set even if you don't actually have any transparency in your images. If you're using photoshop, 'save for web' and de-select 'transparency' or just convert your image to a .jpg. iTunes Connect seems to reject transparencies as well. One of the following, with a 16:10 aspect ratio. 1)iPhone X screenshot support in iTunes Connect.October 27, 2017. 2)You can now upload screenshots for iPhone X.
You’ll see a new tab for 5.8-inch displays under Screenshots and App Previews on your iOS app  version information page. 3)Note that iPhone X screenshots are optional and cannot be used for smaller devices sizes. 5.5-inchdisplay screenshots are still required for all apps that run on iPhone. Run your app on the simulator, and save screen shots. Rename those screen shots to 4.7.1 (iPhone 6), 5.5.1 (iPhone 6 plus) and so on. What are iOS iPad launchpad image resolutions? iTunes Connect Screenshot for iPhone 6/6Plus without Status Bar? Can I upload edited screenshots to iTune Connect for App?